Chiropractic is a branch of healthcare that involves the management of disorders arising from the musculoskeletal and nervous system. Chiropractors use spinal adjustments to correct the body’s alignment to relieve pain, improve function, and to help the body heal itself. Spinal manipulations are gentle, safe and effective techniques which may include joint manipulation, joint mobilisation and, muscular release. Chiropractors go through extensive training and develop a large range of skills to manage your health. Your first session will involve a thorough case history and physical examination to determine the status of your spine, and whether Chiropractic care is an appropriate treatment for you. If no further investigations are required, you may receive a spinal adjustment. A spinal adjustment is used to restore mobility to a joint that isn’t moving the way that it should. If a joint is unstable, the muscles surrounding it will tighten, causing pain and stiffness in the area. A spinal adjustment stabilizes the joint, which allows your muscles to relax - alleviating pain, and allowing your body to heal. Adjustments also stimulate neurological activity in the central nervous system. In your spinal cord, this can reduce pain sensations and muscle spasm, while in the brain; this can improve feedback to areas of the brain that control movement, co-ordination and posture. These neurological effects help to maintain the relief you feel from an adjustment by improving the overall stability of your spine. The Chiropractor will apply quick, but controlled force to the joint, inducing movement to this area through manipulation. Chiropractors are trained to carefully adjust the desired joint while keeping the rest of your body very still. The ‘clicking’ or ‘cracking’ noise associated with adjustments is believed to be caused by changes in the synovial fluid in your joints. Chiropractic adjustments rarely cause discomfort – most report a sensation of relief. If you’ve never been adjusted before, you may experience some mild soreness or aching that usually resolves within 12 to 48 hours. Chiropractors use a range of other techniques to mobilize and stabilize the spine. These include using the hands to release muscular tension, placing wedges under the body, and the use of specialized tables or instruments. Chiropractors are also trained to recommend rehabilitative exercises and lifestyle changes in order to best support your health. The ultimate goal of chiropractic is to help relieve pain, and help you to better manage your condition at home. Jusik was born in Seoul, South Korea, and moved to Australia in 1998. He graduated from Macquarie University in Sydney with a Masters of Chiropractic in 2008. 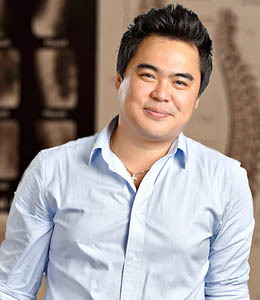 Jusik was the Principle Chiropractor at Total Lifestyle Chiropractic in Airlie Beach from 2009 to 2010. He started his own business at Albany Creek in 2011; originally ‘Youn Chiropractic Centre’ which has since expanded to ‘Your Allied Health Centre’ in 2014 with the addition of other health professionals. Jusik takes a holistic and multi-faceted approach to Chiropractic care. He has a focus on empowering and educating his patients about their health, and is able to perform adjustments using a variety of techniques to suit each individual. Jusik will make you feel comfortable with his kind nature, and excellent communication skills.